Donald Trump’s campaign has begun formally vetting possible running mates, with former House speaker Newt Gingrich emerging as the leading candidate, followed by New Jersey Gov. Chris Christie. But there are more than a half dozen others being discussed as possibilities, according to several people with knowledge of the process. Given Trump’s unpredictability, campaign associates caution that the presumptive Republican nominee could still shake up his shortlist. But with little more than two weeks before the start of the Republican National Convention, Gingrich and Christie have been asked to submit documents and are being cast as favorites for the post inside the campaign. 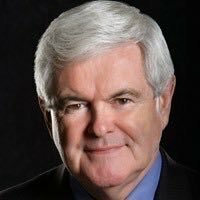 Gingrich in particular is the beneficiary of a drumbeat of support from Trump confidants such as Ben Carson. Sens. Richard Burr (N.C.), Tom Cotton (Ark.) and John Thune (S.D.) have also been bandied about in Trump Tower as options. Sen. Joni Ernst (Iowa) and Oklahoma Gov. Mary Fallin, who previously served in the House, are two of the leading women in the mix. The most interesting tidbit in the article may be that the Trump campaign might announce a running mate next week, instead of closer to convention as originally planned, with the goal of generating positive coverage and reactions from both party leaders and a conservative base that appears to remain somewhat leery of Trump.